Eurograv origins date back to the 1950’s when its founder Robert Attard, left the Royal Electrical and Mechanical Engineering Regiment and started working for the Soldens Printing Machinery Company in North London as a service engineer in the mid 1960’s. He was soon to make a decisive move and formed Eurograv in 1970 with Georgio Andreotti the inventor of the Autotypical rotogravure engraving process to promote and install Acigraf engraving lines, hence the origins of the company name. 1971 Bob Attard opens Eurograv first office in Westminster Bridge Road, South East London, then the heart of the UK graphical industry at that time. The company expands it range to include Gravure printing presses Manufactured by Andreotti, Slitter rewinders, Label printing machines and consumables for the engraving process. 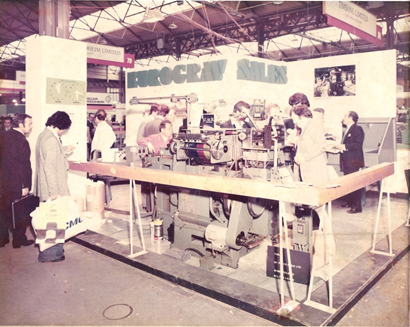 1972, Eurograv attends its first IPEX exhibition at London’s Earls Court, and exhibits a Japanese manufactured Onda label press. This was the current Eurograv Managing Directors, Alan Attard first exposure to the world of print at the age of 12. Photo of the first exhibition stand at Ipex 72. 1976 Eurograv start is long relationship with Ghezzi & Annoni, supplying over 170 machines in to the UK, Irish and North American markets. 1980 Alan Attard Joins the company and attends his first IPEX exhibition, now being held at the NEC in Birmingham. 1981 Eurograv enters the world of Extrusion, taking the representation of Prandi, an Italian manufacturer of Bopp and coating lines and sells its first line to Viking packaging. 1982 Eurograv enters the world of Flexographic Printing machines and joins with CMF of Verona Italy. Later some of the technical and commercial staff of CMF start-up Uteco Converting. 1985 Eurograv is approached by the Schiavi Family of Piacenza to represent their range of Gravure printing presses and coater laminators; this successful partnership gives Eurograv the opportunity to sell large and complex film printing and coating lines and establishes the Schiavi brand in the UK. In 1988 Schiavi join forces with the Bobst Group, who jointly have also recently purchased the flexo company Officina Padane of Modena. Eurograv take on this new range as well as the Bobst Registron brand. This relationship continues until 2001 when the Bobst Group takes a majority stake in Schiavi. 1990 Eurograv re-enters the world of extrusion after being appointed to represent Dolci of Milan Italy, after some successful years with Dolci and with Dolci having financial and ownership difficulties, Eurograv decide to end this relationship. 1990 Eurograv start their long collaboration with FEBA, manufacturers of adhesive tape lathe slitting equipment, this complements with the Ghezzi & Annoni client base. 1993 Eurograv relocated to Byfleet, Surrey to a 5000 sq/ft facility that allows for expansion of parts and consumable storage as well as the possibility to show room some machines. 1993 Eurograv are appointed to represent DW Renzmann, a world leader in the field of press parts washing machines and solvent distillation system, to date around 200 systems have been installed in the UK and Ireland. 1993 with continued sales of flexographic printing presses into the UK and Irish market, Eurograv embarks on a project with Ustec of Turin to design and develop a flexographic plate mounting machine, success follows and the Ustec brand is later given over to a specialist manufacturer in Milan called Camis in order to increase production numbers, industrialise and develop new models and version of the machines. 1998 Eurograv becomes exclusive distributor for CBG Acciai a renowned manufacturer of printing doctor blades for the Gravure and Flexo industry. 2001 Eurograv are re-acquainted with their old friends from the CMF days as it joins forces with Uteco Converting of Verona Italy, now established as one of the most innovative and leading players in the flexographic press market. Since 2001 Eurograv has sold 50 Uteco machines into the UK and Ireland establishing Uteco as a leading brand. 2002 Eurograv and Kiefel extrusion start working together in the field of blown film extrusion, in 2010 Reifenhauser Group of Troisdorf acquire the Kiefel company in Worms and Eurograv takes on the representation of Reifenhauser Group machinery.